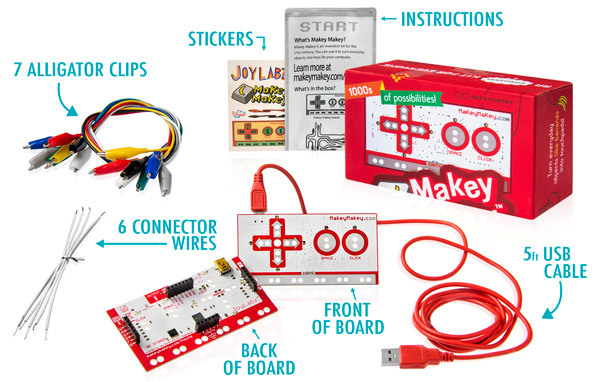 What is Makey Makey? Turn the whole world into a keyboard. It's a simple Invention Kit for Beginners or Experts doing art, engineering, and everything in between. How Does it Work? Alligator Clip two objects to the Makey Makey. For example, you and a banana or an ice cube or a kitty cat. When you touch the banana, the computer just thinks a keyboard key is being pressed, so you can type a letter, jump in a video game, take a picture, or play some music. Who is Makey Makey For? Kids, Artists, Educators, Engineers, Inventors, Makers. Really it is for everyone. 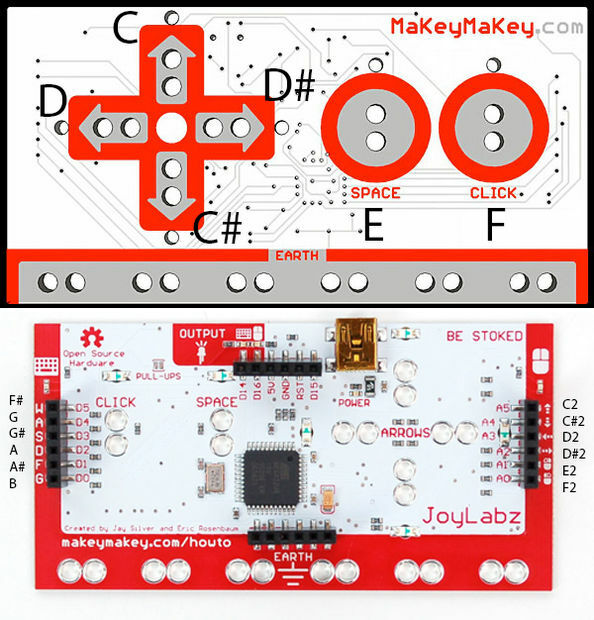 What materials work with Makey Makey? Ketchup, pencil graphite, finger paint, fruits, plants, coins, your grandma, silverware, anything that is wet, pets, aluminum, rain and hundreds more. Really any material that can conduct at least a tiny bit of electricity. What can I create? Make a banana piano, play Mario on a play dough game pad, take a selfie of your cat every time she drinks water. How? First, load up a computer program or any webpage. Let's say you load up a piano. 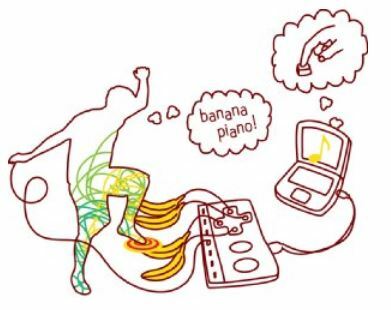 Then, instead of using the computer keyboard buttons to play the piano, you can hook the Makey Makey to something fun, like bananas, and the bananas become your piano keys. Here are a handful of invention ideas. There are thousands of possibilities! Find a free virtual piano from the web. 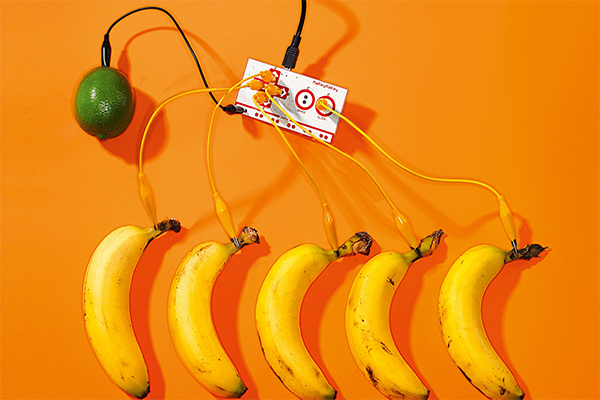 Instead of using your keyboard to play the piano, connect the keys on the Makey Makey to bananas. The bananas then become your piano keys! Make life-size game controllers you can jump on! 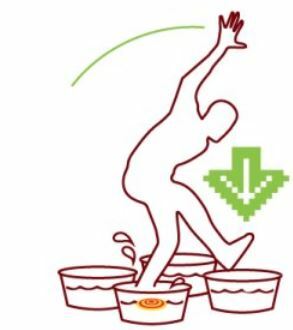 When your foot touches water in a tub, or aluminum foil on the floor, you can play a dancing game or make your character jump! Load up your favorite game or find a new one online. Draw the controls on a notepad with a pencil. Alligator clip the buttons, ground yourself, and play!